Daniel 9:27 Explained: Who Makes Which Covenant? I feel Daniel 9:27 is one of the most troublesome passages in the Scriptures, not in and of itself, but because of the numerous different orderings of words that appear in the various translations. Further, the pronoun, “he” that appears twice in the verse lends even more confusion because most translations do not make clear whether the entire verse is in reference to Christ, the antichrist, or both. And on the wings of abominations…. And on the wing of the temple…. #3 is particularly troublesome because it suggests that a statue of the antichrist will be placed on a “wing” or section of the temple. Is that what the verse is implying? But that is in no way implied in versions 1 & 2. Has anyone who knows Hebrew actually gone back to examine the “he” of v.27 to see if there is some sort of distinction readily apparent in the text, similar to how we capitalize He in reference to Deity, and a small h in he for ordinary humans? This would go a long way to properly interpreting v.27 but, absent that, I’m afraid the controversy over a 3 1/2-year or 7-year tribulation will continue until Jesus returns. Jim raises some great questions about confusion over the correct reading of what is considered possibly the most important prophetic verse in the entire Bible. Who do the three he‘s refer to here? Does one of them (capitalized in NKJV) refer to Christ? Which reading of the variations is correct: abominations or temple? And how long is that tribulation anyway? What is the covenant made about? Does He refer to Messiah or Anti-messiah? This question troubled me for some time after hearing Michael Rood propose that the Messiah is referred to here, not Antichrist, a perspective I had never heard before. After looking at it both ways I’m more confident on this verse than I ever would have been before. The old idea that the one who confirms the covenant is Christ (with his New Covenant) does not fit the context. 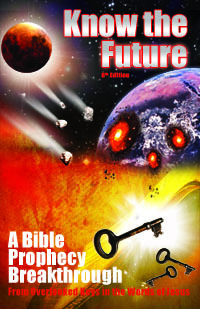 The last eligible antecedent to the three he’s in v.27 is “the prince of the people who shall come and destroy the temple” of v.26 referring to the coming Antichrist, not “the Messiah.” The covenant is naturally understood to last only seven years, a limit that certainly does not fit the New Covenant which will be perpetual (Jer 31:31ff). The doom pronounced on this person matches what is pronounced on the Little Horn of chapter 7 as well as the Beast thrown in the lake of fire in Revelation 19. By the way, I do know enough Biblical Hebrew to explain the deal with the he’s. Not only does Hebrew not have capital letters, but in this passage the verb conjugation automatically implies the masculine singular, so there are no separate personal pronouns to capitalize here anyway. Whenever you see a capitalization of pronoun, take it with a grain of salt because it is the added interpretation of the translator who could be wrong–which is the case here. I always recommend people refer to and use multiple Bible versions rather than rely on one, especially if it’s the old King James which is in hard-to-understand Old English, and 400 years behind in scholarship and manuscript discoveries. The rub here is, as we see in Jim’s questions, that it may take a while before you have the discernment to decide which of the several possible readings is probably the right one and not be left more confused instead of more enlightened. The reason for the great differences Jim noticed are due to manuscript variations. The Hebrew Masoretic Text (MS) gives us the obscure “wing/overspreading of abominations” (yes, plural abominations) while the Greek Septuagint (LXX) reads “wing of the temple.” The Greek New Testament more often follows the LXX reading than the MS. Here the LXX fits better with Matthew 24:15 and Mark 13:14 which refer to Daniel’s abomination being “setup” or “standing” in the “Holy Place” or “where it should not.” If you go with the obscure Hebrew reading, it’s hard to say what it means, but neither does it clearly contradict the NT understanding of this being about something set up in the Temple. The noun here for abomination is always used in connection with idolatry (TWOT). Antiochus IV Epiphanes, the type of the Antichrist prophesied in Daniel 11:31-32, setup a altar and statue of Zeus in the Temple during the time of the Maccabees when he outlawed the reading of the Torah. Not surprisingly, Revelation 13 indicates that there will be a statue of the Antichrist himself commanded by the False Prophet to be worshipped. If the Beast will be setting up his headquarters in the temple declaring himself to be God (1The 2:4) it would make sense for the statue of himself to be setup there at his headquarters, exactly where Daniel’s abomination of desolation is to be setup according to Jesus. What, then, is the desolation? The desolation referred to would be the desecration of the altar that putting such a detestable idol near would cause, a destroying of its true purpose. After Antiochus IV was defeated by the Maccabees they had to have a rededication of the altar. How Long Is the Great Tribulation? The question of how long the Tribulation is does not depend on any of the above questions. See this article for how to determine that with high confidence: How Long is the Great Tribulation? Publicized Peace Treaty With Israel or Secret Conspiracy? Revelation 17:16-17 â€” 16 The 10 horns you saw, and the beast, will hate the prostitute. They will make her desolate and naked, devour her flesh, and burn her up with fire. 17 For God has put it into their hearts to carry out His plan by having one purpose, and to give their kingdom to the beast until Godâ€™s words are accomplished. I am convinced that this is why Jesus never told us to “watch out for the seven year peace treaty between Israel and the Antichrist spoken of by Daniel because there shall be Great Tribulation 3Â½ years later! !” Instead he told us to watch for the Abomination of Desolation spoken of by Daniel the Prophet as the sign the Tribulation was imminent (1290-1260 = 30 days later). The treaty that the Antichrist makes with “the many” (or “the mighty”,”the strong ones” as another possible rendering of the Hebrew HaRabim) by all indications looks to be a secret conspiracy to defeat (America) Mystery Babylon and then set up a one world government or New World Order in her place. If it’s a public treaty then why didn’t Jesus tell us to watch for it and thereby give us a very nice advance signpost? But if it’s secret Jesus would not have instructed us to watch for it knowing that we’d have to be an Illuminati, instead of his disciple, to be in on that signing meeting =). How Long is the Great Tribulation: 7 years or 3½? Who Restores All Things: Elijah or Jesus? Wow, that was informative, ty Tim! Hey i have a question.. who are the illuminati? I’ve heard of the Jesuits, but who are these guys? Ah yea so there part of the Jesuits, and the “Black Pope” and they controle the Pope who is the false prophet correct? Mr McHyde, thank you for your response to my question posted on Five Doves re Daniel 9:27. Your keen insight goes a long way toward helping to clear up much of the confusion I had re that most pivotal of verses. Keep up the good work. No doubt you will see many more of my questions there, but I cannot post a public thanks on Five Doves right now since my AOL software is down. I will just as soon as it is operational. Again, thanks and God bless your ministry. This is all dismissed as conspiracy theory, of course, by most, but the Bible says otherwise.Â The Bible tells us that Satan deceives the whole world (Rev 12:9, yes even, Christians, and on all topics, not just salvation) and he puts whom he wishes in control for the time being (Luke 4:6). God is allowing this to try us and refine us until the end of this age (Dan 11:35). Jim, you’re most welcome and thanks for the great question that I know many share. If there is still one more pope.. then does that mean that this one will only live a short time? Right, all these figures appear to be part of related multi-layered secret societies. For sure, however religious and godly appearing to the casual observer they may appear, they are certainly not carrying out God’s instructions in the Bible. Ah i c, so i take it this last pope to come will be the Anti-Christ and not Pope Benidict? Because in Malachis prophecies it says after the BEnedict branch comes “Peter the roman” – THE END! lol, what a way to end prophecies huh? hehe. Im guessing hes talking about The Anti-Christ as Peter the Roman. He’s the 2nd to last pope and one more must come before the already identified Antichrist at age 60 is beyond ruling age, and the fact that Benedict is already pretty old at 78 years old points to him dying soon. The average life expectancy of a male in the U.S. who lives to be 78 is 8.7 additional years. (National Vital Statistics Reports,Vol. 53, No.6, Nov. 10,2004, p. 16, Table 5). Ooops i mispoke! Sorry hehe, i ment the “Anti-Pope”. At another website you have an article about the Lunar Sabbath in which you claim that it is of no value. You made it sound as though this is some weird calendar yet you gave no scriptural backing only you opinion. With this said can you send me proof that the Roman calendar you use today to keep the Saturday Sabbath is the same day ordained by Yahweh from creation? Keeping in mind that the Romans had a 4 day week and an 8 day week in their history. So do you really think they have the right 7th day Sabbath now? Also how do you justify the FACT that when the Israelites kept the 15th (Sabbath) on the first month (Passover) then on the next moon phase of the 15th they also kept a Sabbath. If they were using the Roman calculated calendar this would be impossible – right? Your article debunking the Lunar Sabbath was very logical. The arguments that you debunked were indeed flawed. However, every Lunar Sabbatarian that I know bases their first argument for the Lunar Sabbath on its congruence with the New Moon. If you follow the instructions to “work six days, then rest”, and also keep the New Moon feast as instructed by YHWH, you will always be in sync. You will never have problems crossing the boundary of a month. The New Moon festival, which is sometimes two days long, but usually one day long, takes care of the Sabbath. Look at how it works on the calendar. Day 1 is the New Moon feast. Work six days. Rest the seventh. This brings you to the eigth. Continue this. Finally you arrive at the 29th day of the month, a Sabbath. Do you then count the next Sabbath from that day? Or do you keep the New Moon feast the very next day the same way you kept the Sabbath? And then start the count of six work days? Remember, the Sabbath was not a commandment given in isolation. It was commanded together with the new moon and other feasts and appointments. If you throw out any little bit of Torah, it will distort how you interpret the rest of Torah. So it is with the Sabbath. Are the New Moons done away with? Fine then, keep your Saturday Sabbath. Noone can say otherwise. #1 – “New Moon feast as instructed by YHWH” you mention does not exist and it is not instructed by YHWH in the Torah. There was a custom of feasting on that day you can see evidence of throughout the OT, but it is nowhere found in Leviticus 23 (with the rest of the appointed times) nor anywhere else in the Torah as a command to rest or do anything as some like Norman Willis teach. If it’s not in Leviticus 23 or the Torah it’s not a feast instructed by YHWH. Many days have commands to blow trumpets or have animals sacrificed on them, but few of them are commanded Sabbaths. You cannot say that because some convocations are Sabbaths they all are. The capital and lower case H are in correct order. Each he represents a different entity. It’s because so many assume that it’s a Jewish temple that they cannot understand why He (capital H) would bring an end to sacrifice and offering. We need to get past the old covenant. There is only one sufficient offering now. The first he represents the the spirit of antichrist ruling amidst the people whom God has called, His spiritual temple. The first he also rules over this same nation which has apostasized from the true faith of Christ. This is the harlot, Mystery babylon. This same he, Oct 2008 went before 33 million people and promised to strengthen and uphold existing agreements of peace and security. It just so happened to be the first day of a feast week. So the lead up to the desolation is a combination of antichrist amidst the people of God, both in and outside the churches. A nation called forth in Christ, that they might be the temple of the living God. This apostasized nation is an abomination before God, therefore He (capital H) has had enough, brings it to an end, she has defiled the temple, and God will allow the 10 horned beast to destroy the harlot nation and peoples. This is the end of the spiritual sacrifice and offering brought about by He, Gods righteous judgement. The final he is one who makes desolate. A 10 member nation whom god has put in their heart to destroy the harlot. America, it is you! You are the harlot nation called forth in rightoeusness. But now you are drunk on the wine of the wrath of God. You have destroyed the temple, and now God will destroy you. People, it is time to flee……. TheHarlot is a GREAT CITY on 7 hills, and so its most likely Jerusalem-but could be Mecca, as the AC will be MUSLIM but SHIA, and will cut a swath down through the SUNNI nations on his way to Israel. As far as Dan 9:27, one must look at all the other texts which point towards this event: the abomination. At the end of the day, you have an AC figure invading Jerusalem and setting up the abomination, whatever on the wing means. That figure is predicted 2 other times in daniel. â€œAnd from the time that the daily sacrifice is taken away, and the abomination of desolation is set up, there shall be one thousand two hundred and ninety days. At the end of the day one must conclude that the antichrist will invade a temple. WHat will he do when he does this? “HE” WILL STOP THE SACRIFICE RIGHT? Is He Jesus or the AC? according to Jesus and Daniel , the overwhelming evidence is that the antichrist will do so! In many other texts, God warns Israel to not make a treaty, and they do, and so he allows an invasion on the day of the Lord. DEATH. BUT IT WILL BE ANNULLED. I WILL LAY IN A ZION A PRECIOUS CORNERSTONE. ISAIAH 2 EVERYONE WILL SEE THE LORD RETURNING IN THE AIR. HER ON THE DAY OF THE LORD. SIN. HE WILL BE A COVERING OF FIRE. RUINS AND ONLY A REMNANT REMAINS. TIME, ASSYRIA WILL INVADE JESUSâ€™ LAND. ISAIAH 9 THE PEOPLE OF GALILEE SHALL SEE A GREAT LIGHT. BUT AT THE END THERE SHALL BE DARKNESS. PEOPLE, NOW I WILL JUDGE HIM. BANNER FOR ALL THE NATIONS. THE HOUSE OF DAVID SHALL REIGN. ISAIAH 17 DAMASCUS IS DESTROYED. MEN WILL LOOK TO THEIR MAKER. TRUMPET. BIRDS WILL FEED UPON THE DEAD. ISAIAH 19 THE LORD COMES TO EGYPT ON A CLOUD. BROTHER WILL BE AGAINST BROTHER. THE REDEEMER WILL COME TO ZION. AND SHINE FOR THE GLORY OF THE LORD IS COMING! FOREIGNERS WILL REBUILD YOUR WALLS. JERUSALEM, FOREIGNERS WILL REBUILD YOUR WALLS. ISAIAH 62 JERUSALEM SHALL NO LONGER BE CALLED DESOLATE. RAISE A BANNER TO THE NATIONS! ISAIAH 63 THE LORD TREADS THE WINEPRESS OF HIS WRATH. THIS IS THE DAY OF HIS VENGEANCE. FOR JERUSALEM IS A DESOLATION! BUT THE LORD WILL NOT DESTROY THEM ALL. ISAIAH 66 THE LORD COMFORTS ISRAEL AS HE COMES IN FIRE. THERE WILL BE A NEW HEAVENS AND A NEW EARTH. The answer is simple, it’s referring to the Anointed One who happened to be Jesus Christ(Yeshua). ““The days are coming,” declares the Lord, “when I will make a new covenant with the people of Israel and with the people of Judah. It will not be like the covenant I made with their ancestors when I took them by the hand to lead them out of Egypt, because they broke my covenant, though I was a husband to them, ” declares the Lord. “This is the covenant I will make with the people of Israel after that time,” declares the Lord. “I will put my law in their minds and write it on their hearts. I will be their God, and they will be my people. No longer will they teach their neighbor, or say to one another, ‘Know the Lord,’ because they will all know me, from the least of them to the greatest,” declares the Lord. “For I will forgive their wickedness and will remember their sins no more. JESUS CHRIST COMPLETED THE 31/2yrs. Now, put these number in order that fits into the scriptures. Starting with years and days. 7years and 50days.